Arrecife offers a nice collection of quality Arrecife apartments for the holidaymakers on their Lanzarote holidays. 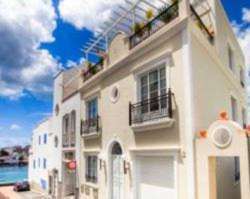 These seafront apartments are 50 meters from Reducto Beach. They offer bright accommodation with free Wi-Fi and a balcony with views of Arrecife Bay and the Parque Islas Canarias Botanic Gardens. Apartamentos Islamar Arrecife feature pastel décor. The lounge includes a sofa bed and TV with DVD player, there is a kitchen and the bathroom comes with a hairdryer. The Islamar Arrecife complex is within a 5-minute walk of numerous bars, restaurants, and shops. 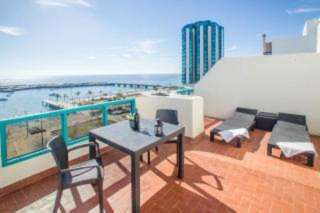 This attractive apartment is located 50 meters from the harbor in Arrecife. It offers stylish accommodation with free Wi-Fi and complimentary fruit and champagne upon arrival. Casa Tucana features elegant décor with artwork, antiques and Persian carpets. The Tucana is 15 minutes’ walk from the beach and 10 minutes’ drive from Costa Teguise and its golf resort. Arrecife also has a market which takes place twice weekly. 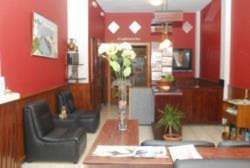 Free public parking is available near the property and Lanzarote Airport is located just 8 km away. Pension San Gines is set 50 metres from the San Gines Lagoon. It, offers a sun terrace with views of the lagoon, free luggage storage and a free Wi-Fi zone. Rooms feature simple, functional décor. Several bars, restaurants and shops are within 5 minutes’ walk. San Gines is 10 minutes’ walk from Reducto Beach and the ferry port. The MIAC Contemporary Art Museum in San Jose Castle is 1 km away and the Costa Teguise Golf Resort is 10 minutes’ drive away. Pension San Gines is 5 minutes’ walk from Guaguas Bus Station and 12 minutes’ drive from Lanzarote Airport.